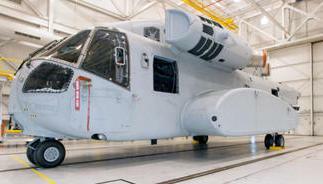 June 7, 2013 - Sikorsky Aircraft has received a $435 million U.S. Navy contract to build four production representative CH-53K heavy lift helicopters for the U.S. Marine Corps. Designated as System Demonstration Test Articles (SDTA), the four aircraft will enable the Marines to conduct operational evaluation of the new helicopter system in support of Initial Operational Capability in 2019. Once the SDTA aircraft enter operational evaluation in 2017, the Marine Corps will verify the CH-53K helicopter’s capability to carry 27,000 pounds over 110 nautical miles under “high hot” ambient conditions, nearly tripling the external load carrying capacity of the current CH-53E Super Stallion helicopter. Technology enablers for increased lift include three 7,500-shaft-horsepower GE38-1B engines; a split torque transmission design that more efficiently distributes engine power to the main rotors; fourth-generation composite rotor blades for enhanced lift; and a composite airframe structure for reduced weight. "The SDTA contract represents an exciting and significant milestone in our program," said Col. Robert Pridgen, the Heavy Lift Helicopters program manager for the Naval Air Systems Command. "We are well on our way to making the CH-53K a reality for our Marines and our Naval fleet. The capability this aircraft brings, in every clime and place, is critical to sustaining the future missions of the Marine Air/Ground Task Force. The future of heavy lift is bright."